Modern Design. Enhanced Features. Statesman Reliability. 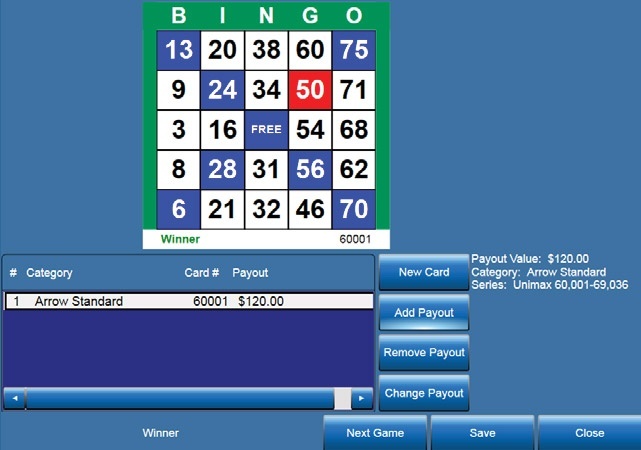 With the advanced technology used by the Statesman Premier bingo console, operators can take their bingo sessions to the next level. An uninterruptible power supply protects the console's hardware against power surges and will operate from the battery backup in the event of a power outage. The DR III scans the ball matrix and communicates with the Gaming Computer. It incorporates composite video output for monitors and flashboards. Digital video output from the Gaming Computer is converted into composite video for the Data Router, and analog VGA video for the front mounted TV. 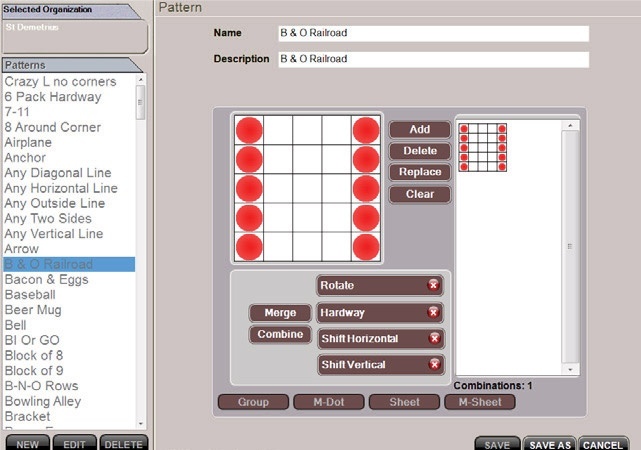 An optional Ethernet report printer can be used by operators to print detailed gaming schedules, payout reports, and error logs. A hi-res camera transmits a live ball image to monitors driven by the console. The data router and video converter support video output for player monitors and flashboards. With many players utilizing electronic gaming, the Statesman Premier offers support for Blue Dog mobile devices with an additional verifier. The modern, ergonomic cabinet is designed for optimal operator comfort and efficiency. Aluminum extrusions on the console's exterior provide increased structural support. Our colour-coded ball tray has numbered rows to match bingo balls, and sealed switches with rubber caps in a separate chamber to protect against liquid spills. A fully adjustable 17" LCD touchscreen monitor moves up and down, tilts, and rotates. It also incorporates a touchscreen that works seamlessly with a mouse or USB keyboard. The Statesman Premier's illuminated ball chamber features a large, wrap-around acrylic window, providing players with a view of the balls from two different sides. 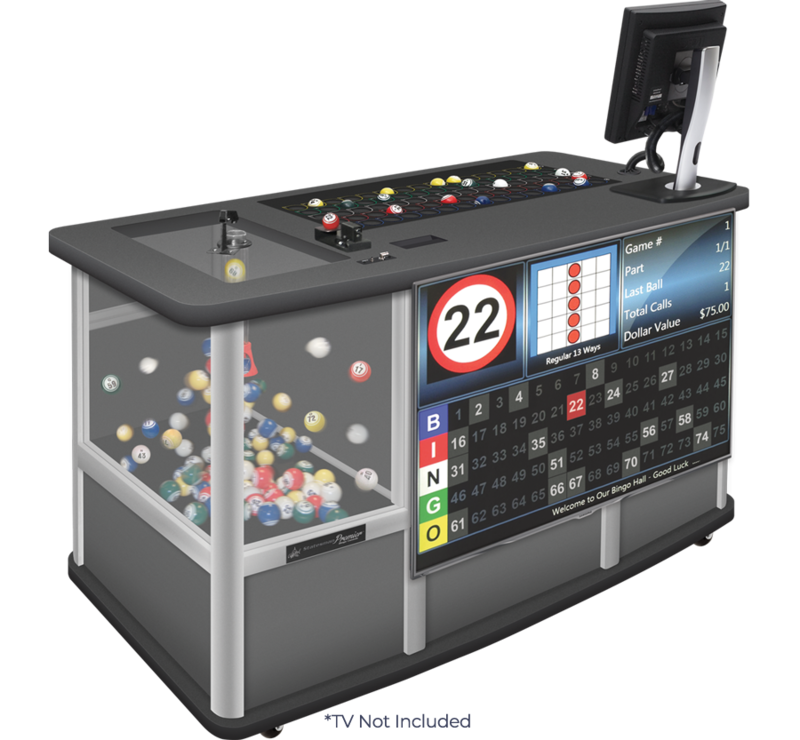 With an insulated ball chamber, improved soundproofing, and a special anti-static foam mat to cushion bingo balls, the Statesman Premier provides soft, quiet operation. The Statesman Premier features an easily accessible switch panel and knob controls for the light in the blower chamber, mixer motor, main blower chamber, and ball tray. 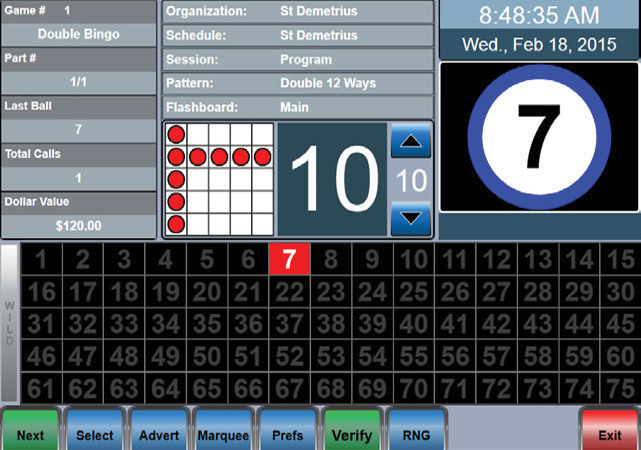 The Statesman Premier's intelligent, user-friendly software features quick reference pop-up screens, easy-to-follow menus, and expanded programming capabilities - all with detailed and vivid colour graphics. The Statesman Premier uses a Microsoft ® operating system with a customized gaming application shell developed by Arrow International. 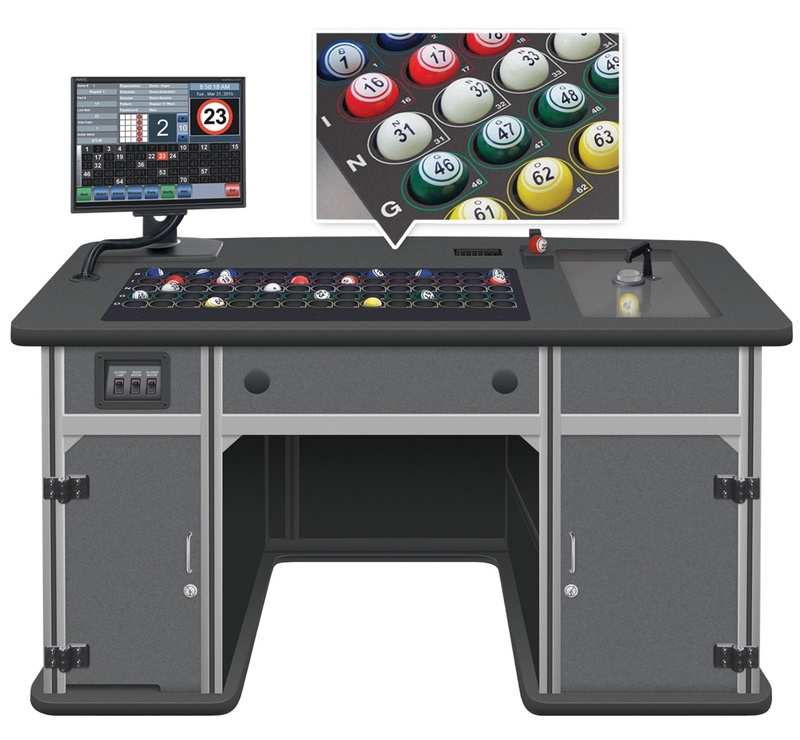 Unlike other PC-based bingo consoles, the Statesman Premier has incorporated a solid-state drive (SSD) in lieu of a traditional hard drive, resulting in a reliable, faster and more powerful system. The Statesman Premier was designed with an emphasis on reliability, and a strong focus on a simplistic method of service and maintenance. A detailed Operators' manual is provided to assist you with installation and guide you through set-up, operation, and troubleshooting. To ensure that your console continues to perform to your satisfaction, we offer a variety of support plans customized to meet your needs. Can I use any type of bingo balls? No. For the optimal anti-static operation, it is strongly recommended that only the included set of Tru-Max ™ bingo balls be used with the Statesman Premier bingo console. Does the Statesman Premier support all flashboards? The Statesman Premier is equipped with state-of-the-art technology to support all of the latest E-Max, Arrow, Capitol Game, and Bingo King flashboard models, including Tear-Opens/Bonanza and video/multimedia flashboards. Is a flashboard required to operate the Statesman Premier? No. The Statesman Premier can operate using hall monitors or with the optional mounting hardware and customer-supplied flat panel TV. Is the optional TV available for purchase from Arrow? No. Only the mounting brackets and hardware are available as an optional purchase from Arrow. For a complete list of TVs recommended by Arrow, please contact your sales representative. Does the Statesman Premier verify all Arrow bingo paper? Yes. 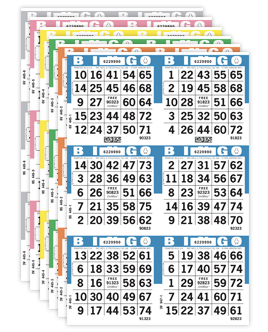 The Statesman Premier features built-in, secure electronic verification for all Arrow bingo paper, including support for multi-face patterns.